This November, California voters will head to the polls tasked with deciding their state’s water future. Proposition 1 – the Water Quality, Supply and Infrastructure Improvement Act of 2014–-is a $7.5 billion general obligation bond measure placed on the ballot with a near-unanimous, bipartisan vote by the legislature and Gov. Jerry Brown that, if approved, will fund investments in water projects and programs as part of a statewide, comprehensive water plan for California. 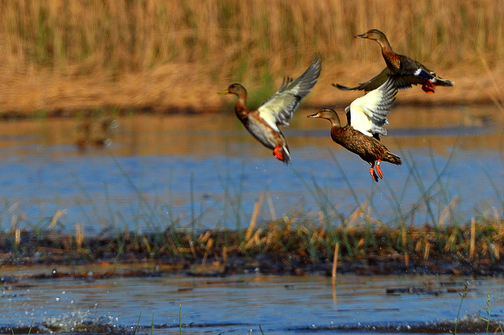 Proposition 1 is a step in the right direction for waterfowl conservation. This bond includes funding to help support habitat restoration and enhancement for migratory birds, while specifically remaining tunnel neutral in regards to the Bay Delta Conservation Plan. Ducks Unlimited, along with other conservation organizations, played a large part in the crafting of the bond and we are encouraging our members and others to VOTE YES on Proposition 1 on November 4th. California needs balanced policy solutions that work for birds, families and farmers. Prop 1 supports our sportsmen’s heritage, allowing us to manage wetlands and waterbird-friendly agriculture so that future generations can enjoy healthy wildlife populations and robust hunting for years to come. You can also click here to view a PDF information sheet. Thanks for all you do to help support habitat conservation and our hunting heritage.